“Knowledge is like the baobab tree; no one person’s hand can encircle it alone.” The Ewe proverb is the motto of the Nunya Music Academy in Dzodze, Ghana. It was also the guiding principle of the 3rd Biennial Orff Afrique Master Class that was hosted by Dr. J.S. Kofi Gbolonyo and the Nunya Academy in Dzodze. For two weeks I learned how to play traditional Ewe drumming pieces and learned how to dance traditional Ewe dances. I also learned to play the gyil and the atenteben. All of these sessions were taught by master teachers from Ghana. I played traditional games with the students of Nunya Academy and was so fortunate to be able to see them perform. Each night there was a different group performing traditional Ewe music, and always there was an invitation to join in and dance with them. Culture, history, politics were topics of conversations throughout the course. Not just from Kofi, but from his family, from the people who worked at the hotel, from the many performers I saw, from the renowned choral composer, Water Blege, from the Chief of Dzodze, from the people of Dzodze, and from everyone that we met along the way. All of them coming together and encircling us with their knowledge of Ghana and Ewe culture. It is that community learning that I want to bring back to my students and to my school. Knowledge comes from all of us working together, listening, and sharing ideas. These experiences also give us a deeper understanding of ourselves and each other. So much time is spent in our schools preparing for the next assessment. Our students are always being asked to show what they know, in a sense, perform. In Dzodze, many of the groups that I saw perform, weren’t there to perform for the audience. They were there because they love to sing, play, dance and perform with each other. If the audience enjoys the performance, then that is an added bonus. I would like my students to have more opportunities to sing, dance and play with each other because it is fun. My hope is that these opportunities won’t just be in the music room, but also in the classrooms, at recess, anywhere. Thank you, AOSA, SF Off and Kofi Gbolonyo for giving me the opportunity attend Orff Afrique Master Class in Dzodze, Ghana. It was a powerful experience and I am so blessed to have been able attend this course. Stacey Johnson teaches K-5 music education at Verda James School in Casper, WY, USA. She received her Orff-Schulwerk certification from the University of St. Thomas in St. Paul, MN, USA. In 2014, I was fortunate enough to attend the first Orff-Afrique course in Dzodze, Ghana, run by Dr. Kofi J.S. Gbolonyo and the music teachers of the San Francisco Orff Training Program. This incredible 2-week course was filled with dancing, drumming, singing, xylophone, and cultural trips, as well as performances by Nunya Academy, and other local traditional musical groups. This experience has had a lasting impact on me, as well as my students who have loved learning about the music and culture of Ghana and West Africa. 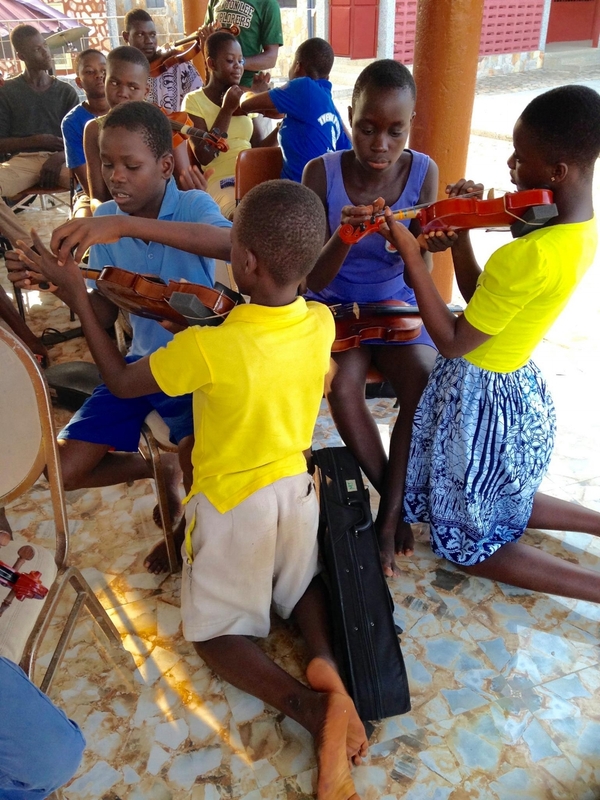 While I was there, I found out that not only was being a guest teacher at Nunya a possibility, but that they had violins, violas and a cello donated to the academy that were just sitting there because there was nobody to teach strings. It was the end of the trip when I told both Kofi and Prosper (Nunya’s assistant director and Kofi’s brother) that I wanted to come back to teach strings someday. One morning in early 2017, I opened my email to find out that Kofi would be holding the 1st Nunya Summer Institute for Advanced Studies in West Africa Music, Dance and Culture. I knew as soon as I saw it, I was finally going back. I contacted Kofi, told him I wanted to sign up for the course, and that I would like to stay another week to help start the strings program at Nunya. He sent me the most gracious and enthusiastic email accepting my proposal, informing me that another strings teacher, Mary Jackson-Richardson, would be staying to teach strings as well. And so we started planning through numerous emails and texts between Kofi, Prosper, Mary and myself. Prosper went through the instruments, cataloguing the sizes and repairs needed. On our side, Mary and I started collecting parts, repair tools, bows, strings, rosin, shoulder sponges, and other accessories, as well as a few more violin donations to bring with us. It was a little nerve wracking to figure out what we needed to repair instruments before we left, because once we were there, there wouldn’t be a local music store to run down to for a broken violin strings or other parts. Whatever we brought with us was our store. All the planning paid off. By the time we were ready to teach, we were able to restore 32 violins and violas of varying sizes, as well as one ½ size cello. The plan was to teach each of the 2 campuses separately. We would spend 3 days at the Hatsukorpe campus, which is currently a large, open aired room in Prosper’s house, as well as 3 days at the Dzodze campus, which is currently the Gbolonyo family compound house. As the students were still in school during the day, we only had about 2 hours for each session, which meant a total of 6 hours with each group of about 40 or more students. So we had a plan, and yes, not quite enough time! Before teaching strings to the Nunya students, however, we had 2 weeks of classes with Kofi and other guest teachers to experience. A typical day’s schedule went something like this: Dance at 6:30 am with Kofi, followed by breakfast. Drumming for half the morning with Kofi and Oliver Torgboh, a local drummer, musician and teacher, followed by gyil lessons with Sampson Kuudenign, a teacher from the University of Accra. Lunch was long enough to eat, and to journey to the market using the two main forms of public transportation: a motorcycle, or a trotro, a small van. After lunch, more drumming and dance, as well as a lecture on various aspects of West African culture, or what Kofi humorously refers to as “blahblahblah.” After dinner, there were performances at night, by Nunya or other local traditional music groups, all of which ended with everybody dancing together at some point. Finally, we went to bed at the end of the day with images and rhythms of Ghana floating through our minds. Although that was a “typical” day’s schedule, no two days were ever the same. While we were scheduled for about 7 hours of actual instruction a day, we never stopped learning and experiencing Ghanaian culture between classes. There were often special cultural experiences throughout the day that you would only get as a student of this course. For example, on our first day, we paid our respects to the village chief who, along with the village elders, welcomed us to Dzodze. We then met Kofi’s immediate and extended family at the family house and although there was a language barrier, there were warm smiles, gestures and laughs that made us all feel at home. After that, we went to Kofi’s uncle’s house for a homemade traditional Ghanaian lunch where we sat under the shade and ate too much food because it was so good. On the first day of teaching, students began arriving at the Hatsukope Campus in groups of varying sizes and ages. Somehow, through the constant chatter, introductions, and 40 bodies moving in a space, students ended up in seats with instruments in their hands. The full size violas were given to the biggest students, all high school boys. We made every attempt to give students a violin that fit them, but in the end there were still full size students playing ¼ size violins and other students sharing. The cello made its appearance on the second day, and wound up in the hands of a high school boy who had been quite successful on his viola. Mary and I decided technique was the most important thing on which to focus during our short time with Prosper and the students. When we discussed beforehand what music we would eventually play, Prosper assured us, “Once they know a scale, they can play anything,” which pretty much proved to be true. So, onward we went with how to hold the violin, how to hold and use the bow, and how to play the D major scale. As Mary and I made the rounds to help students one-on-one with their bow holds, we heard students figuring out “Twinkle, Twinkle, Little Star” on their own, They were clearly enjoying the process and challenge of their new instruments. By the end of the first 2-hour session, the students were able to pluck as well as bow the D major scale, and “Twinkle” as a group. Our sessions with the Dzodze students were held at the White Dove Hotel, which is where the adult participants stay for Kofi’s courses. Our first day with the Dzodze students yielded not only the D major scale and “Twinkle”, but also a version of the “Our Father” Prosper had taught them on their wind instruments. The students on this campus were just as engaged and excited to learn a stringed instrument. By the end of the week, students from both campuses were able to bow Twinkle, French Folk Song, Ode to Joy and the Our Father as a group. Mary and I were impressed with how quickly they picked up the music, as well as the technique. This is obviously a result of having Prosper as their teacher for both traditional and Western music. They have learned to really listen, both to the music, and to instructions, as well as how to transfer the concept of playing from one instrument to another with relative ease. Each session with each campus had so many funny and memorable moments. One of my favorites was seeing Prosper playing his violin the first day while surrounded and cheered on by his students, who obviously love him and were sharing his excitement for his new instrument. Another picture I still see in my mind was how the students immediately started helping each other, whether they were sharing an instrument, or had their own: one person’s victory was everybody’s victory. The staff in Ghana includes Becky, who is Prosper’s wife, who is also a high school English teacher; Daniel, a high school science teacher who teaches math to the Nunya students; Achtu and Promise, members of the Gbolonyo family. In the end, that is what Nunya Music Academy is going to give the students lucky enough to be part of the school. They are going to be not just great musicians, but will also be good citizens, not just in Ghana, but in the world beyond its borders. There is no doubt that Nunya is going to have students follow Prosper’s footsteps to be a music teacher, or Daniel’s to be a math or science teacher, or Becky’s to be an English teacher, or even to follow Kofi’s footsteps to other parts of the world to study, perform and teach, many with the intention of returning the opportunities given to them through Nunya. Mary Maravic is a strings, rock band and general music teacher at the Seacoast Charter School, Dover, NH, an arts integrated Pre-K through 8 school. Her instructional approach is Orff-based with an emphasis on world music and culture. When she is not telling students to stop playing while she is talking, she can be found playing double and electric bass for local music groups. Photos used with permission by Tae Hoon, the album where they are located can be found here. I met Kofi Gbolonyo three years ago through our mutual friend, Curtis Andrews. Right from our first meeting I could tell there was something special about him and as he described his vision for the Nunya Academy, I was immediately intrigued. Since then, we have become very good friends and my students have had the privilege of having Kofi as a guest artist in the Jazz Studies department at Capilano University on many occasions. He always brings a great deal of joy, positive energy, and musical knowledge to our students. Capilano Jazz students have been involved in collecting instruments, funds, and supplies for Nunya over the past couple of years and my family and I were lucky enough to be in Dzodze with Kofi last July when the instruments arrived. I also had the privilege of teaching clarinet to the Nunya students for a few days and really enjoyed my time with them. Despite some trepidation, my daughter, Isabelle, taught her first flute lesson and had some very eager and thankful students. One of the most important aspects of our family’s visit to Dzodze was meeting Kofi’s family. All of them are involved in some way in helping Nunya to grow and flourish. Of particular importance to the success of this project are Kofi’s brother Prosper and Prosper’s wife, Becky. While Kofi is traveling all over the world engaging support for Nunya, Prosper is there every day teaching the students and Becky is likewise busy organizing, keeping records, feeding people, and helping to manage all those children. They selflessly give so much of their time to the project and are truly inspired and inspiring people. The Nunya students performed an incredible concert for us that showed how much work and effort is being put into the project by so many people. On Friday, April 21, 2017, we held a benefit concert at Capilano University for the Nunya Academy. The show featured Kofi’s community dance and drum group, Adanu Habobo, along with Capilano’s Percussion Ensemble, Rhythmic Music Ensemble, C Band, and faculty guests. Adanu Habobo presented traditional music from Ghana and the Capilano groups presented a wide variety of African-influenced jazz arrangements, including big band settings of traditional pieces, Ayikoo Na Mi, Nyame Dua, and Ghana Nyigba. A special part of the event for our student performers was wearing the colorful Ghanaian costumes provided by the Gbolonyo family. Kofi marshalled a huge contingent of percussionists on every tune aided by Capliano percussion instructor, Dave Robbins. The concert raised $1100 CDN for the Nunya Academy and the music and dance were thrilling. I look forward to seeing all the Nunya students again when we return to Ghana in summer of 2018. I am the director of The San Francisco International Orff Course, the institution that sponsored Orff-Afrique. We all have a profession that might seem a little unusual to the average Ghanaian. We are called “music teachers” and our job is to teach music to children. But in a culture where singing is as natural as speaking, dancing as natural as walking and music is everywhere a part of daily life, this must seem strange—how do you “teach” something that everybody just does? Do we teach the children how to walk, to eat, to breathe? I have written many books on music education and again, you might be puzzled by the title of one of them: Play, Sing & Dance. ” Well, of course!” you think, “How else does one make music?” But in our worlds, music has become separate from life, treated as a special talent or optional activity. To learn it, you have to go to special classes or special lessons and sometimes this costs a lot of money. And then when we do learn it, we sit down at a piano or hold a violin and spend a lot of time reading symbols on paper and practicing where to put our fingers on the instrument. We don’t dance the music we’re playing, we often don’t sing it, we don’t understand what the message is or what other lessons it is teaching. And so that’s why we come here. You have something we have lost. You have something we need. Your children can play, sing and dance so much better than ours, doing it all with so much energy, joy, ability to listen and blend with the others. They are teaching us so much about how to play, sing and dance with the children we teach. Thank you for welcoming us to your beautiful culture. In my own 42 years of teaching at one school, this has been my mission—to create a musical culture, a musical community where music and dance are part of the school’s daily life and something every child—and teacher and parent—enjoys. This is the gift that the Ewe and other cultures can impart, bringing a bit of village wisdom and feeling into a modern contemporary institution. What do we have to offer in return? As vibrant and whole as traditional cultures can be, they also have their own shadow, their own limitations and their own necessary steps to take to thrive in contemporary 21st century culture. How to do it without losing the wholeness and integrity of the best of village life? Enter Nunya Academy, joining the old with the new, the traditional wisdom of the village with the latest innovations in modern thought and practice. Here all the students are guaranteed exposure to and mastery of the songs, dances and drumming that have carried on unbroken in Ewe culture, ensuring that the wisdom of the Ancestors will continue into the future. At the same time, they’re given access to contemporary Western instruments, particularly brass and woodwinds. They’re experimenting with innovative arrangements that introduce them to new techniques, new styles, new feelings. Their teachers are trying out some of the innovative pedagogical ideas of approaches like the Orff Schulwerk. Beyond music and dance, these students will also need to gain facility in English as a lingua franca in the marketplace, master contemporary computer technologies, cultivate mathematical, scientific and analytic thought. Nunya’s mission to educate the whole child recognizes that is the blend of the old and the new, the intuitive and the intellectual, the heart and the mind, that will give these children the opportunities they deserve. As mentioned above, Nunya already has deeply impacted the 60 plus music educators from some 15 different countries who came to Dzodze in 2014 and 2016. Now it is our responsibility to pay Nunya back and offer the financial support to realize their largest dreams. Several of the participants from those courses have not only contributed personally, but also organized fund-raising concerts. This Fall, with the help of my colleagues Sofía López-Ibor and James Harding, I organized and co-directed such a concert at The San Francisco School. It was a huge success, both musically and financially, featuring a volunteer ensemble from our Middle School and another neighboring school, as well as other adult musicians who had worked before with Dr. Kofi Gbolonyo. The theme was music of the African diaspora. The program started with a West African/Ghanaian set with students performing on traditional and Orff instruments, followed by performances of Afro-Venezuelan music. We then presented roots music from the American South and its modern iterations of blues and jazz. Finally, as no Ewe gathering is complete without a social dance, all groups joined together to play and dance Bobobo. This is a style originally created to gather support and strength in the movement for independence. The San Francisco School in California, USA, hosted a Nunya Music Academy Fundraiser in the fall of 2016. “We need music every day of our lives. Music is what energizes us, calms us, consoles us, shares our joy, awakens us from our slumber, connects us to ourselves and our fellow human beings. But some days, we need music more than anything. This past week for many of us has been one of those times. So many of us wondering how we are going to survive what just went down, how to keep our little candle of hope lit and our courage strong. And no better place to turn to than the people who have been down this path so many times and for so long and always, always managed to rise up singing. All music is necessary and powerful and beautiful, but the music of the African diaspora gives us that something extra, that story of people struggling against impossible odds and kept alive and vibrant through music, kept themselves together and connected with music. Getting these pieces ready for today, I felt the ancestors in every note reminding me that they are there with us, they got our back, they’re there to catch us when we fall down and lift us back into the dancing ring. The superior man tries to create harmony in the human heart by a rediscovery of human nature, and tries to promote music as a means to the perfection of human culture. When such music prevails and the people’s mind are led toward the right ideals and aspirations, we may see the appearance of a great nation. Doug Goodkin is currently in his 42nd year at the San Francisco School, where he teaches music and movement to children between three years old and eighth grade. He is the author of 8 books on music education and is an internationally recognized Orff Schulwerk teacher who regularly gives workshops around the world. He is the director of The San Francisco Orff Certification Course, teaches his own course on Jazz and Orff Schulwerk in San Francisco and is one of the leading teachers in the Orff-Afrique program hosted every other summer by Nunya Music Academy. To learn more about Doug's work and read more of his writing, see his website here. Agobaya mefoanu dzro o. Yae doa nofu ne. The palm does not speak by itself, it is the wind that causes it to do so. If you’ve come across this website you have probably come in contact with, or have heard of, J.S. Kofi Gbolonyo. If you have happened on this website without any knowledge of Nunya Music Academy’s founding director I highly recommend you find a way to learn from him as it will change your life - it surely changed mine. I met Kofi Gbolonyo in 2007 in Hong Kong. He was a visiting artist at the Hong Kong International School and I was working there as a music teacher in the second year of my career. In the fledgling years of my life as a teacher, I was aware that my worldview was incomplete, it was why I became an international school teacher, to experience it firsthand. During an afternoon jam session in his first week at my school, Kofi put me on the gangokui, the Ewe name for a double bell, and he proclaimed that this would be my instrument for the rest of his visit. My job was to keep the repeated patterns going, patterns that often held all the other instruments in the percussion ensemble together. At first look, the bell seems like a harmless, low-stress job. Little did I know, Kofi would challenge my musicianship with West African rhythms that make you feel like you’ve turned your brain inside out, scrubbed it clean and, in doing so, lost all concept of the placement of the downbeat. More challenging than picking my musical ego up off the floor, during our time together Kofi would also expand my definition of what perseverance looks like. Kofi works tirelessly to maintain and preserve the traditions of the Ewe people and, in doing so he hoped to improve their quality of life. He is determined to bring the world to Ghana and bring Ghana to the world. Little did I know, almost ten years ago, I would have a part in his mission. Kofi’s time as a visiting artist in Hong Kong would be the first of many opportunities that we would have to learn from each other. Each time, I would be in awe of his ability to balance sharing and translating Ghanaian music, dance and culture to a Western audience without sacrificing its richness and authenticity. His tenacity for giving context and meaning in a way that is digestible for your average Western musician is invaluable for music educators worldwide. 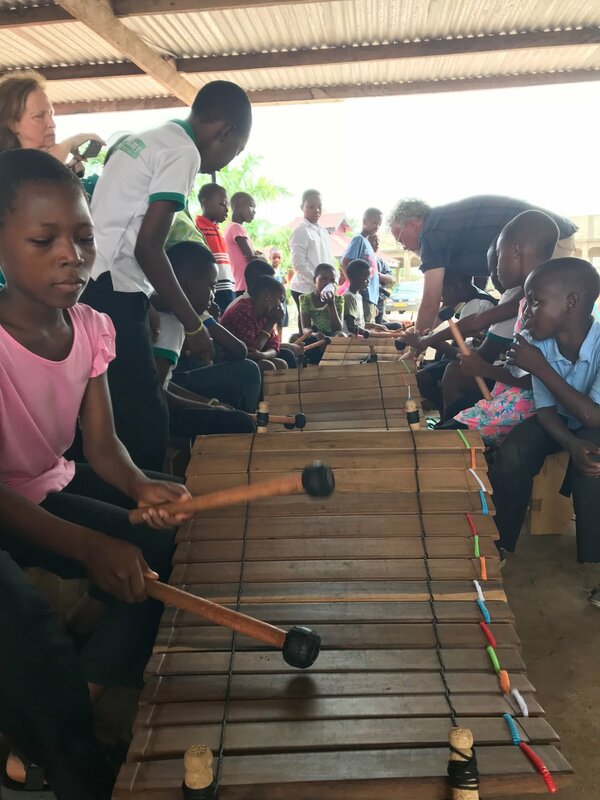 In 2014, in collaboration with the San Francisco Orff Summer Course, Kofi hosted the first ever Orff-Afrique master class in his home village of Dzodze, Ghana. I quickly signed up to be a part of this experience, excited by the opportunity to finally learn from Kofi on his “own turf.” The course was amazing, but what made it so remarkable, beyond the games I learned, the fabric I bought or the newfound connections to other music educators, was my interaction with the students from Kofi’s school, the Nunya Music Academy. 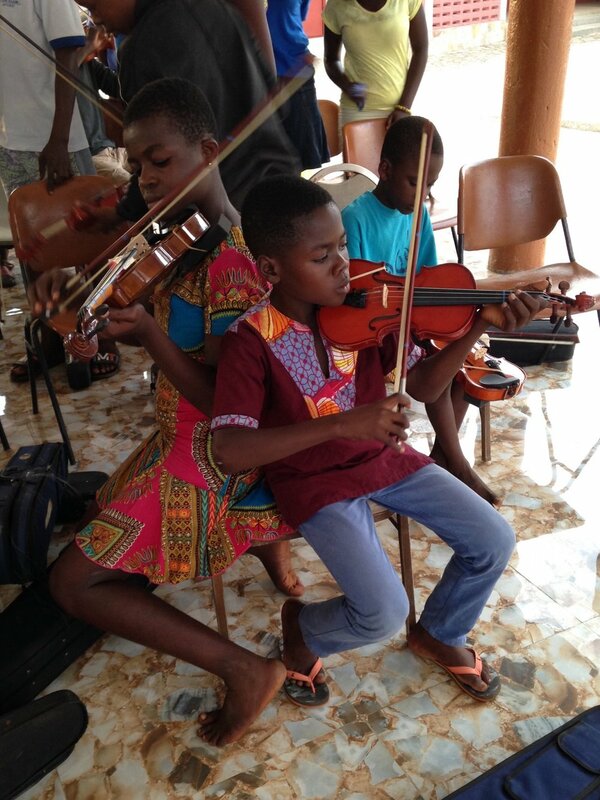 Located in the Volta Region in southeastern Ghana, the Nunya Music Academy is an institution that provides free Western and traditional Ghanaian music education to any willing child. The students who attend Nunya Music Academy, which is currently hosted in the Gbolonyo family home and runs as an after school activity, are a vibrant example of the value and potential this educational approach can bring to a community. These students not only possess awe inspiring musicianship and abilities in movement that are natural component to the Ewe culture, but they also possess an inspiration to use these abilities to go further, to connect to the world through their music and dance. Kofi and the students who attend Nunya Music Academy belong to the Ewe ethnic group, which is one of the largest in Ghana. In the Ewe language you will often hear their greeting “Woezo” which translates to “you are welcome.” The common response of the visitor is then “yo” which means "yes" or “thank you.” Kofi enjoys pointing out that Western communication often involves giving thanks first and then responding with “you’re welcome,” whereas the Ewe people do it the other way around. A decade into my teaching career, I’ve learned that my worldview will always be incomplete. There would always be more to learn and new places to explore. However, watching children from the Nunya Music Academy perform with pride and connect to foreign educators so earnestly, moved me to find out what I could support and contribute to what I did know. They had welcomed me so warmly, I wanted a way to give them my thanks. I found my role in giving thanks for Nunya in creating this website. My intention is to use it to amplify Kofi’s message and that of the students of this school to digital citizens everywhere. It is my hope that this blog will serve as a forum for the plentiful voices surrounding this institution. A place for people to share their stories of how they too were moved by Nunya or how they contributed to help this community build something truly unique. Every other month we will have a guest blogger including students, teachers, volunteers and donors telling their story of how Nunya brought the world to them or how they helped to bring it to Nunya. We look forward to your return, but for now, weozo, you are welcome. Ashley Benusa is a Performing Arts teacher at the Canadian International School of Hong Kong. She is currently serving as the webmaster and Director of Technology of the Nunya Music Academy.